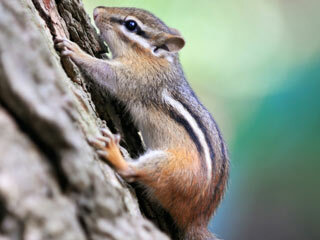 Eastern Chipmunks are reddish brown fur on top and white belly fur, with a black white black strip on each side. They are 7-10” long and weight 2 1/5 to 5 oz’s. They mate in early spring and have a litter of 3 to 5 young in May. They are usually ground nesters but if given the opportunity they will create a den inside your house.